Gustavus John Waterhouse was born in Westbury, Tasmania on 10 May 1850, son of the Reverend Jabez B (d.1891) and Maria A Waterhouse. He was the grandson of the Reverend John Waterhouse, the first superintendent of the Wesleyan Mission in Tasmania. The family were living in Maitland in 1864-65 and Orange 1868-70, in which year Gus turned 20. In 1871, the Waterhouse family moved to Waverley in Sydney. In 1874, Gus Waterhouse married Mary Jane (known as ‘Janie’, 1853-1935), the daughter of Ebenezer Vickery, MLC, and his wife Jane, nee Begg, at the Waverley Methodist Church at Bondi Junction. Gus and Janie had three sons and two daughters. Their eldest son Gustavus Athol Waterhouse (known as Athol, 1877-1950) became an eminent entomologist; the second son Eben Gowrie Waterhouse (known as Gowrie, 1881-1977) was a professor of literature and languages at Sydney University and an authority of camellias; and the third son Leslie Vickery Waterhouse (known as Les, 1886-1945) was a mining engineer. Their two daughters, Jeanie Pearl and Ivy Augusta, died in infancy. Gustavus John Waterhouse died at Woollahra on 3 August 1929 and was buried in the Vickery Vault at Waverley Cemetery. Gustavus John Waterhouse arrived in Sydney by 1871, when his father was appointed Wesleyan Minister for the Waverley Circuit. In 1873, Reverend Jabez B Waterhouse was living at Old South Head Road, Woollahra. Gus appears to have joined the NSW Rifle Volunteers around 1871. Gus was employed by his future father-in-law, Ebenezer Vickery, in around 1870; the official Directory and Almanac of Australia 1883 noted that Gus had more than 12 years experience with Messrs E Vickery and Co. Gus Waterhouse’s career evidently prospered under Ebenezer Vickery, which gave him experience in trading with the Pacific Islands, including the Solomons, the Hebrides, Samoa, Tonga, Rotumah and Fiji. Gustavus John Waterhouse set up as an importer and exporter at 63-65 Pitt Street, Sydney, trading as G J Waterhouse & Co. He developed business interests in shipping and trading, with several vessels under charter to New Zealand, Queensland and Fiji, and by the 1890s, came into direct competition with Burns Philp in Papua. Ordinary mercantile business included consignments of merchandise from South Australia, Victoria, Tasmania and New Zealand. The 1895 Sands Directory described Waterhouse as a ‘general importer, Shipbroker, and South Sea Island trader’ based at the Vickery Chambers, 38 Pitt Street, Sydney. It appears that the business ceased trading by c1900; in January 1907, the Australasian Methodist Missionary Review reported that Gus Waterhouse had retired from active business. Gus Waterhouse was a Justice of the Peace (JP). His private residence was Ellerslie in Birrell Street, Waverley, built c.1885 on the Vickery estate and now part of the War Memorial Hospital. In May 1905, Gus and his wife retired to a property called Weroona at Woodford in the Blue Mountains.They lived there until his death in 1929. Mary Jane Waterhouse was a notable shell collector and donated the Waterhouse Collection of Mollusca to the Australian Museum in 1930. During his travels around the Pacific, Gus collected many artifacts and shells that were the genesis of his wife’s shell collection. On 16 October 1930, the Australian Museum Magazine recorded that a number of Gus’s artifacts had been donated by his eldest son Athol. Many other artifacts were donated to Sydney University. During the 1890s, Gus had become increasingly involved in the Waverley community and it’s likely this cut into his business activities. He was an alderman on Waverley Council in 1891-99. He was a founding member of Waverley Bowling Club in 1892 (and its President in 1893-95). He was also President of Waverley District Cricket Club in 1896-97, and President of the Waverley Benevolent Society in 1901. He was heavily involved in Methodist church affairs, as a layman and as a benefactor. A stained glass window in the Woodford Methodist Church commemorates his active interest and generosity to the Methodist Church. Gus Waterhouse was Secretary to the Fiji Commission at the Sydney International Exhibition of 1879-80, for which he was awarded a silver medal and a bronze medal (now held by the Powerhouse Museum). Gustavus John Waterhouse served as alderman of Waverley Council from 1891 to 1899 and was the mayor of that council in 1897 and 1898. Waterhouse was elected to Sydney City Council as Alderman for Gipps Ward from 1 December 1899 to 6 December 1900. Although his term as elected alderman was to end on 30 November 1902, he lost his Gipps Ward seat when ward redistribution and the election for aldermen were held early in December 1900. He was a member of the Finance Committee and the By-laws Committee between 1899 and 1900. Alderman John Norton claimed he coined the word ‘wowser’ to refer to Alderman Waterhouse. 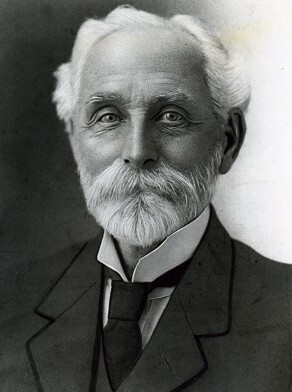 After moving to Woodford in the Blue Mountains in 1905, Waterhouse continued his involvement with local government, serving four terms (in 1908, 1909, 1910 and 1911) as President of the Blue Mountains Shire Council. Additional biographical information about Gustavus John Waterhouse courtesy Michael Waterhouse. J W Evans, ‘Waterhouse, Gustavus Athol (1877–1950)’, Australian Dictionary of Biography, National Centre of Biography, Australian National University, http://adb.anu.edu.au/biography/waterhouse-gustavus-athol-8992/text15829, accessed 23 November 2012. W M O’Neil, ‘Waterhouse, Eben Gowrie (1881–1977)’, Australian Dictionary of Biography, National Centre of Biography, Australian National University, http://adb.anu.edu.au/biography/waterhouse-eben-gowrie-8991/text15827, published first in hardcopy 1990, accessed online 15 January 2016. Michael Waterhouse, ‘Waterhouse, Leslie Vickery (Les) (1886–1945)’, Australian Dictionary of Biography, National Centre of Biography, Australian National University, http://adb.anu.edu.au/biography/waterhouse-leslie-vickery-les-11971/text21459, published first in hardcopy 2002, accessed online 15 January 2016. Waterhouse, Michael, ‘Janie’s Legacy’, Explore, Vol 35, No. 1, Autumn/Winter April to July 2013, pp. 2-3.